Creatine. Along with protein, a bodybuilding staple. No other supplement has more scientific research behind it. Over the years, marketing departments at various supplement companies have tried to convince you that their creatine product is better, faster, stronger. You’ve been flooded with choices. So confusing... Creatine citrate. Liquid creatine. Effervescent creatine. Creatine gum. Creatine serum. Creatine topicals. Let’s set the record straight. Simple, powdered creatine monohydrate is the real deal. Only the creatine monohydrate form has been extensively proven in numerous clinical studies. Only creatine monohydrate powder. Not creatine citrate. Not any other creatine delivery system. Liquid creatine destabilizes creatine and turns it into creatinine, a waste by-product. 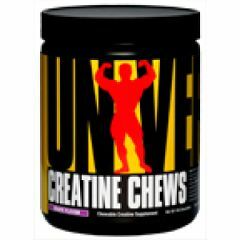 In Creatine Chews, you get only creatine monohydrate powder. We compress it into a convenient size, flavor it, and that’s it. You chew it and get all the benefits.